public float speed; //Floating point variable to store the player's movement speed. 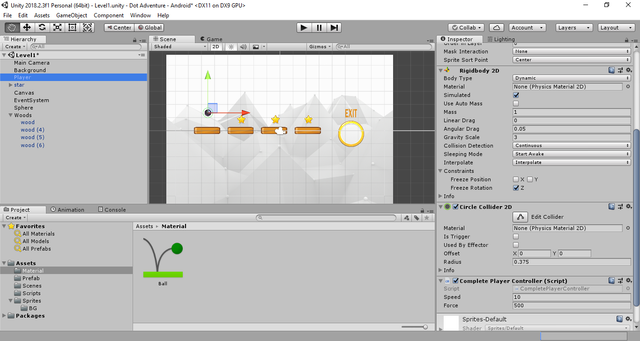 private Rigidbody2D rb2d; //Store a reference to the Rigidbody2D component required to use 2D Physics. the bounce and movement is correct. what i want right now is to make the effect of land, i mean when the ball hit the floor, the floor should go down and up again, like Dot adventure game. is there a reason why you don't want to use spring joint 2D component for the platform? i have tested spring joint 2D but it's not the best solution, the ball is related to the platform and i don't want that. any help please guys ? ?